Cue Ricky Martin's "Livin' La Vida Loca." Tech investors are partying like it's 1999. The Nasdaq is rapidly approaching the 5,000 level and is less than 4% away from all-time highs that were set 15 years ago. These landmark levels are bringing back bad memories of the late 1990s, when people went crazy over money-losing tech stocks (and bad pop songs). The good times ended when the bubble popped in March 2000, causing huge losses for investors and making many tech companies to disappear. All of this begs the question: Does the fact that Nasdaq has joined peers like the Dow in record territory signal another bubble is brewing in tech stocks? No, this tech party doesn't appear destined to end in tears. That's because today's tech stocks look all grown up. They're more fundamentally sound than their 1999 peers, and their valuations are based on something the dotcom stocks of the past never had: real earnings. "There's no bubble when it comes to technology stocks," said Scott Kessler, head of technology equity research at S&P Capital IQ. Kessler should know. He was covering the industry back when the last bubble was inflating. Eyeballs vs. earnings: Back then companies like Pets.com and Internet delivery services Webvan and Kozmo.com raced into the public markets at huge valuations, despite the fact they generated no profits and often little to no revenue. Investors basically had to invent their own performance metrics like "eyeballs" -- how many users were looking at these websites -- to justify those lofty price tags. "The debate boiled down to the question of whether earnings or eyeballs were the most important metric, and Wall Street guessed wrong," David Joy, chief market strategist at Ameriprise Financial, wrote in a note to clients this week. Investors failed to realize how important it was to translate those website visits into real profits. Related: Tech stocks are on fire. How high can they go? Ridiculous price tags: The exuberance for tech stocks caused valuations to skyrocket far beyond what, in hindsight, was reasonable. At the peak of the mania, the Nasdaq was valued at more than 100 times forward earnings, compared with a far more sensible 20 times today, according to FactSet data. That's not much above the S&P 500's forward price-to-earnings ratio of 17.5. 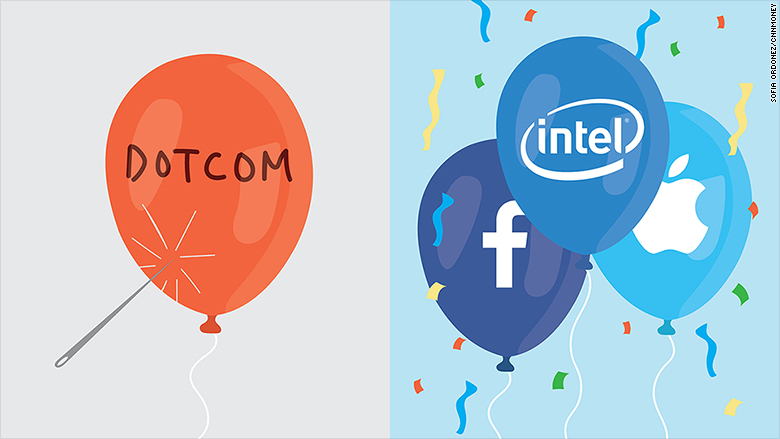 The biggest companies in the index today include household names that are making money hand over fist like Apple (AAPL), Google (GOOGL), Facebook (FB) and Intel (INTC). Just last month, Apple alone hauled in a record-breaking $18 billion during a single quarter. Fortress balance sheets: Today's tech titans are also sitting on lots of cash. It's not just Apple with its mind-boggling treasure chest of $178 billion, but other companies like Microsoft (MSFT), Google, Cisco Systems and Oracle literally have more cash than they know what to do with. That wasn't the case during the dotcom bubble when tech companies had little money other than what they raised during their IPOs. "When they were faced with calamity, they had no wherewithal to ride out the storm," said Kessler. 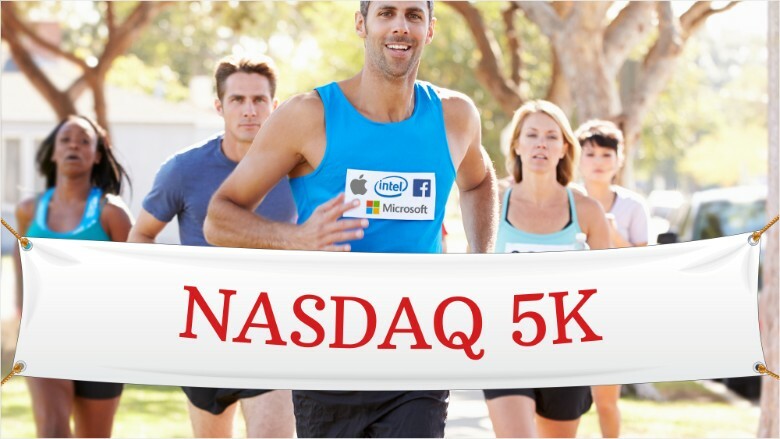 All of this explains why investors shouldn't fear the Nasdaq's new milestones. "We should welcome a new high in the Nasdaq, as it will indicate that it, and we, have matured in our understanding of the Internet and its possibilities," Joy said. Related: Profitless IPOs are all the rage. Bubble alert? Shadow bubble? Of course, that doesn't mean a bubble won't eventually form in tech stocks, or that one isn't already being inflated elsewhere in world of technology. Just look at the eye-popping valuations venture-backed companies like SnapChat, Pinterest, Uber and even Shazam are reported to have landed in recent weeks. "If anything, it seems like there could be a bubble forming in the private markets," Kessler said.